Which mom do you feel like this week? Social Susie: Hellooooo, fellow adult at the park! Is that swing next to your kid taken? I’d love to swap graphic childbirth stories with you as we push our children on the swings! Reserved Rachael: I really want to reach out to that clearly sleep-deprived mom with the mismatched shoes, but I’m afraid my conversational attempt will be seen as creepy and awkward. Isolated Isabella: I don’t ever see other moms. I don’t know where to meet new people, and the only decent park is 17 miles away. Pooped-Out Paula: I have a few mom friends, but I’m too tired and busy to really commit to spending time with any of them, so I mostly just feel guilty all the time for being a lousy friend. Solitary Samantha: I hate people. Okay, not really. But to be honest, I can barely handle the tiny humans I’m raising, and when I do get a break, I’d rather spend it in sweet, quiet isolation instead of subjecting myself to social obligations. No matter which of these mama spirits we’re currently channeling, we all have this in common; we all need mom friends. Truth is, we all need other mothers to help us carry these unique burdens. We all need a strong shoulder to cry on from time to time. But how do you MAKE those mom friends? Well, that can be a bit of a nightmare. Especially for those of us who feel just a little too similar to The Big Bang Theory’s Sheldon Cooper. Fortunately, way back in the second season of TBBT, Dr. Sheldon Cooper invented a clever device known as the “Friendship Algorithm” to help us out. So, let’s take a look at this algorithm and see how easily it can be modified to accommodate us in our quest to make mom friends. Although not technically part of Sheldon’s algorithm, you do have to start by selecting your potential new mom friend. But how do you know whether someone showed up at the library storytime because she’s secretly hoping for a moment of sweet, glorious solitude or because she’s as desperate for adult interaction as you are? How much simpler would it be if we had a silent, mass-understood mom signal, using color-coded wristbands? You know…green for those desperate for friendship, yellow for the exhausted moms who are surviving solely on caffeine and sarcasm, red for the moms who are just done “people-ing” for the day and want to be left alone, etc. *sigh* Perhaps that idea will make it into Shark Tank eventually, but for now, we’ll have to rely on the old-fashioned way of making friends: Starting an actual conversation. Finally, if technology is more your style, apps like Peanut, Hello Mamas, and Hey! VINA can introduce you to new local mom friends from your couch at home. When your time out of the house is rare and precious, and you’d rather have a preplanned “mom date” waiting for you when you do leave, these apps can help you arrange that! Now it’s just a matter of the actual arranging. If you’re having trouble encountering other moms in your daily life, check out Chelsea’s thoughts on “mamaraderie” for additional ideas. The first stop on the Dr. Cooper’s flowchart is “Place Phone Call” followed by steps to take dependent on whether the callee answers. But let’s be honest. As moms, is a phone call really the best way to reach us? I’m so grateful that we now have so many ways to be contacted that don’t involve interrupting a diaper change to sprint to answer a phone before it stops ringing! Considering your shared situation of being consistently chin-deep in motherhood and other commitments, you may be better off sending a text message or contacting her via the current popular social technology. All you have to do is invite her to do something. Offer to host a playdate. See if she wants to join you and your kids at a nearby park. Let her know you have a couple of free hours on Saturday in case she’s free to join you for a cup of coffee. Make good on that promise to text her when you make plans for that Junior Star Trek Convention. The options are endless, really. You might just have to take the first step and reach out. Things are only more complicated for everyone now. The mom you may want to spend time with now has another entire person (or two…or three…or nine…) whose schedule she’s in charge of. So unlike a potential romantic date who may take three days to contact you, a mom may take three weeks. But if she doesn’t return your text (or other form of electronic messaging), feel free to try once or twice more. After all, we all know how easy it is to forget things amidst the motherhood mayhem. Just don’t make those text messages too frequent, or you’ll turn yourself into a real Wolowitz. In keeping with the spirit of our favorite physicists (and engineer), I did a little math regarding Sheldon’s Friendship Algorithm and discovered that 40% of the boxes are devoted to food. If you’re wondering whether food would be a good way bond with your new gal pal, here’s a good rule of thumb: Including food is never a bad idea! Provide meals during bed rest or a postpartum period. Moms (especially hormonal, lonely moms) don’t forget this type of kindness easily! Offer to bring a meal any other time, if for no other reason than because she seems a little stressed. Even if she’s not expecting, every mom’s favorite meal is one she doesn’t have to cook. Enjoy dinner together on a night out away from kids. I mean, seriously, that sounds truly glorious, doesn’t it? Provide a mom’s favorite food group—coffee. 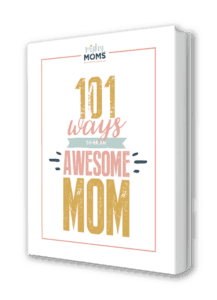 Whether you end up sitting on overstuffed poufs at a locally-owned, bohemian café or texting her for her Starbucks order as you wait in line, gifting her with a hug in beverage form is sure to make any mom’s day! (Oh, and as a side note: If you’re not bringing meals to people in one of these amazing double-decker thermal casserole totes, you’re doing it wrong. They are life-changing! They keep meals deliciously warm and safely guard those pristine, spotless seats in your car (*cackles* nope, couldn’t type that with a straight face) from possible spills. Another significant component of Dr. Cooper’s Friendship Algorithm is the seeking out of common interests. Most moms have at least a few common interests, such as naptime or finding comfy clothes that are actually cute. Common interests are an important factor in finding new moms friends. However, if this appears to be a challenge, then Step #6 will be extra useful. One of the most truly beautiful aspects of friendship is how it can introduce us to new ideas, possibilities, and experiences. Howard helped Sheldon discover that when he introduced a loop counter to Sheldon’s flawed flowchart. Be open to exploring new interests, and see where it takes you! Perhaps you’ll learn that you really enjoy the piano works of Johannes Brahms or that you’re insanely good at Call of Duty. Bohnanza: Not to be confused with Bazinga, Bohnanza is an inexpensive, flexible game that is fun with two players, seven players, or any number in between! It’s a great game for those days when sleep deprivation is stealing your mental capacity, and you don’t need a game that’s too mentally taxing. Pandemic: If you’re concerned that letting someone see your scary competitive side may end your friendship before it starts, a cooperative game like Pandemic where you can work on the same side to beat viruses and save the world is a great bonding exercise. Dominion: Out of the games listed here, it’s the one that is most conducive to playing while children are nearby. A strategic, deck-building game, there are no small pieces, and since each player’s turn requires minimal participation from the other players, you can take breaks as needed to refill sippy cups and fish shoes out of the toilet. Forbidden Island: Like Pandemic, this is considered a cooperative game where all players collect the treasures and win or drown together. Plus, its big sister Forbidden Desert, works on a similar basis, but has some added challenges to ramp up the difficulty. Once you’ve established the “Who? What? When? & Where?” of your first mom date, there’s just one thing left to do: Invest fully in the experience. Relax, be yourself, and have fun! In order to be a great mom, you need to be a great woman, which means understanding your unique mothering style, practicing self-care, and having a solid support system. Cultivating friendships is the best way to grow your community and build a sisterhood you can call on when you need a second opinion or a sympathetic ear. So ladies, don your green wristbands and get out there! As you head to the beach/library/park/zoo/gym/Comic-Con/etc., take note of all the other moms out there who are doing their best to survive this parenthood gig. You’re bound to find a few others out there who need a friend just as much as you do! What is Your Mothering Style? Take the Personality Quiz to Find Out!